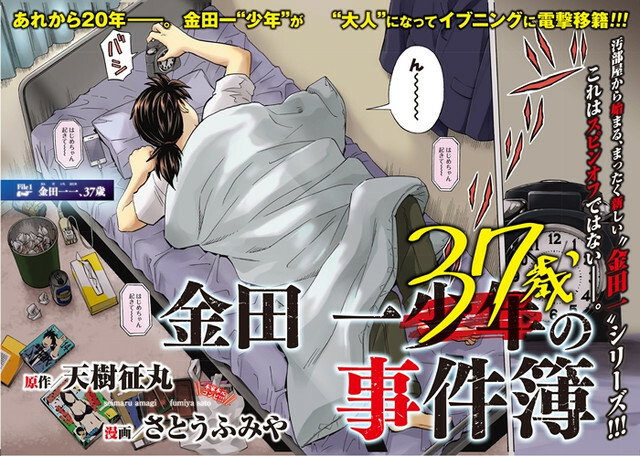 The latest 4th of 2018 issue of Kodansha's biweekly manga magazine Evening, released today in Japan, started serialization of Kindaichi 37-sai no Jikenbo/The Kindaichi Case Files at His Age of 37, a sequel to The Kindaichi Case Files maystery manga series illustrated by Fumiya Sato, featuring the protagonist Hajime Kindaich who turns 37 years old. The story set in 20 years after the original series. Hajime is no longer a student detective, working as a poor office worker now. The original The Kindaichi Case Files manga series told the crime solving adventures by Hajime Kindaichi, the grandson of the fictional private detective Kosuke Kindaichi (originally created by Seishi Yokomizo for his mystery novel series), in his high school days. It had been serialized Kodansha's Weekly Shonen Magazine for several arc and series since 1992, and has printed over 90 million copies. One of the two original story creators, Seimaru Amagi (Detective School Q) is attached to the sequel alongside the illustrator Fumiya Sato. The tagline: "An all-new Kindaichi series that begins from a dirty room!!! This not a spin-off--." Check Out Preview for Voice Actress Kaori Ishihara's Solo Debut Single "Blooming Flower"